I walked these halls before. And everytime I am reminded that despite it’s breathtaking beauty, it’s like a walk in the mall. I spent last weekend in and around Zion’s National Park. The geology of Southern Utah is largly sandstone. Utah used to be under water and over millenia, the rivers and the sea laid down layer after layer of sedimentary deposits. That silt and sand eventually turned into sandstone. Sandstone is realatively soft. Rivers cut right through it. Well, over thousands of years, they do. Today some of the canyons are a hundred feet deep or more. No picture can do justice to the spectacular views. I am constantly amazed everytime I walk into those natural cathederals. I vowed to only take pictures of truely inspiring portions. I couldn’t do it. Every step is an amazing experience. One that few get to enjoy. 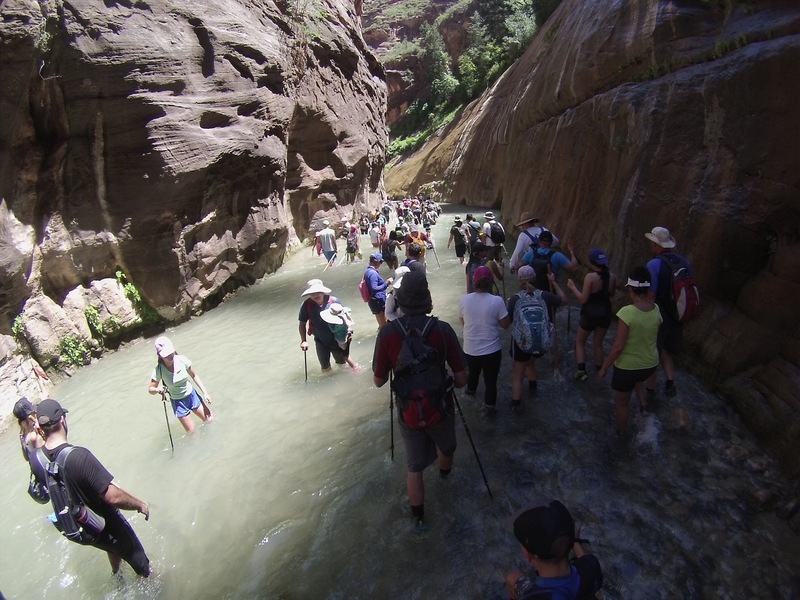 The Narrows, the most popular attraction at Zions, is wall to wall people on a Saturday in July. 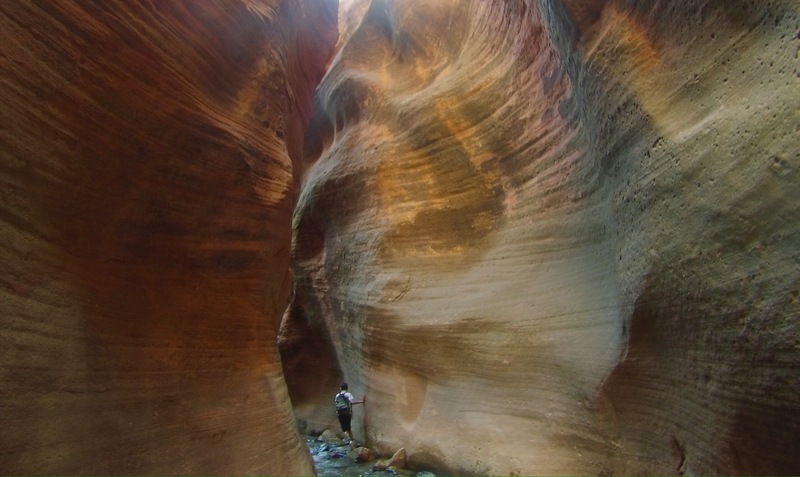 The Narrows is a section of the Virgin River that is marked by towering cliffs on both sides. Thousands of people flock here every year. We went with a group of boy scouts. We challenged them to keep their ears open and listen for different languages. We heard Japanese, French, German, Spanish and several more that I couldn’t place. People come from all over the world to experience our beautiful National Parks. It’s a short 3 hour drive for us from our homes in Pleasant Grove, UT. I’ve heard that most New Yorkers never go to the Statue of Liberty unless they are hosting someone from out of town. Why is it that we don’t appreciate the things closest to us. I long ago gave up trying to figure out if “The World According To Rodney Bliss” was normal or not. In fact, I have pretty good evidence to the contrary. Anyone who imagines that bliss is normal is going to waste a lot time running around shouting thathe’s been robbed. My family and I try to take good advantage of the wonders around is when it comes time to vacation. We went to Yellowstone last summer, we’ve been to Zions. We load the kids on the train every year to go see the Christmas lights at Temple Square in downtown Salt Lake City. Given the choice of having the beauty all to ourselves, or enduring the crowds, I think I’ll take the crowds. What natural or man made beauties do you have in your area? Do you go see them?